The 4th of July is obviously an all American holiday, and as we celebrate our freedom from the British, we may as well celebrate one of their classic dishes - the Scottish Egg. 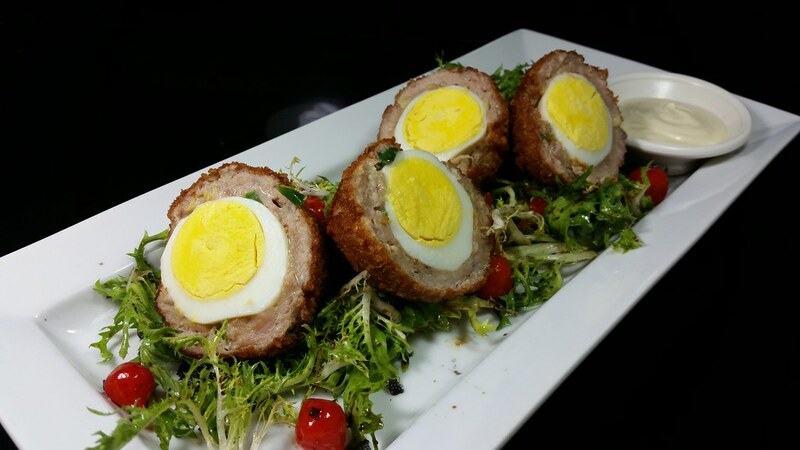 The British classic is a hard-boiled egg wrapped in meat. The most important part of the Scottish Egg is the aforementioned meat. We can all boil eggs.........right? So what we do is take some housemade Italian sausage and fold in some whole garlic cloves and jalapeno peppers to give ours a little twist. The egg is thought to be originated in the early 1700's by Fortnum & Mason of Piccadilly. It's said that any British pub can have its level of culinary ambition determined by its attitude towards Scottish eggs, and we know ours can rival some of the finest out there. Come celebrate our national holiday and freedom with a taste of the country it was earned from!